Congratulations to senior music education major Caleb Bohanan, whose work while student teaching has inspired a radio program. While teaching music at Pittsburgh Shiller 6-8 STEAM Academy with cooperating teacher Shayne Stromberg, Caleb developed a composition unit incorporating the history of hip-hop music and its power to address social justice issues. Students were guided to write and produce their own songs addressing issues they felt were important. Bohanan designed the unit plans, delivered the instruction, and coached the students through the process. Many of the students’ resulting projects have now been chosen to be part of a collaboration between Shiller and the Children’s Museum of Pittsburgh’s “Saturday Light Brigade" radio program. The compositions will first be recorded at the museum and then aired. 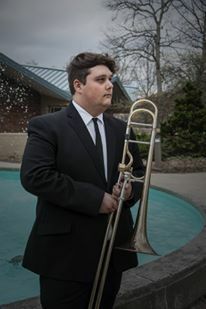 A trombone major, Caleb is in the studio of Mark Lusk, and his student teaching experience was supervised by Darrin Thornton. After his May 2016 graduation, he intends to pursue a teaching job in music.